Indian and Pakistani food is rich and varied. 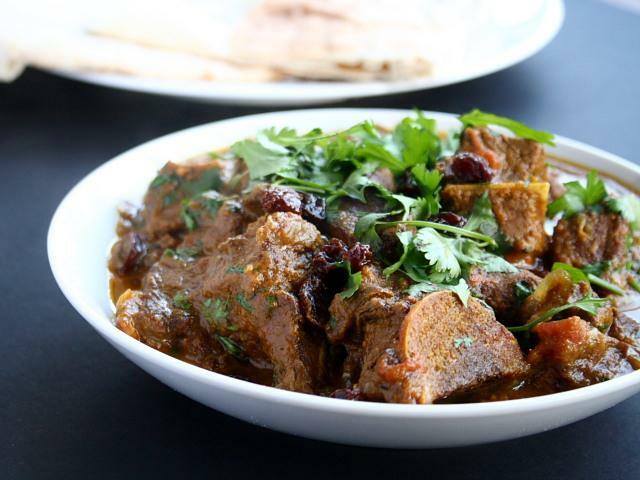 I’ve cooked countless lamb or mutton curries, each with the same basic method and ingredients, each of which have been vastly different because of subtle differences in spicing and small tweaks in ingredients. The length of the list of spices that go into most curries means that no two are ever likely to turn out the same, anyway. Different batches of spices taste different…some are stronger than others, some might be a little on the aged side, having sat around in a cupboard for too long, some might have been toasted before being ground, a practice that opens up a whole new smokey dimension to many common or garden spices. The best advice around spices is to buy little and often, so that they stay fresh. Buying spices from a supermarket in dinky jars at exorbitant prices is not the answer. If you’re lucky enough to live near a decent Asian grocer, use it – you’ll find smallish packets of everything you need for literally pence. You’ll find packs of spices big enough to flavour a curry for an army too, if that’s who you want to cook for. Neither will cost you much. So, this lamb curry is yet another variation on a theme, yet another startlingly different dish. Start with about a kilo and a half of cubed lamb or mutton – either is good, but mutton is cheaper and tastier. Save your lamb for cooking quickly as kebabs. Fry the meat in a large, deep pan in a big glug of groundnut oil until its browned all over, and then set aside on a plate. As usual, small batches, don’t crowd the pan, etc., etc. As the meat browns, start to make the sauce by blitzing two onions, five cloves of garlic and the ubiquitous thumb-sized piece of peeled fresh ginger in a blender with a splash of water until smooth and lump free. Pour the blended onion, garlic and ginger – truly the Holy Trinity of Asian cuisine – into the pan you used to brown the meat and let it bubble and sizzle for five minutes or so, stirring and scraping so that it doesn’t stick. Add a tablespoon of ground coriander, two teaspoons of ground cumin and a generous teaspoon of turmeric to the pan and stir in, before adding three large tablespoons of plain yoghurt, one at a time, stirring constantly so that the yoghurt blends seamlessly into the sauce. Finally, add a couple of medium-sized tinned tomatoes and gently crush them with a spoon, letting them slip into the sauce. Keep cooking, keep stirring, keep an eye on the bottom to make sure that nothing sticks. A splash of water helps to keep things moving. As the sauce turns a deep, earthy brown colour, add the meat back into the pan, along with one and a half teaspoons of salt, half a teaspoon each of ground cloves, ground nutmeg and ground cinnamon, a quarter teaspoon of cayenne pepper or more and a liberal grinding of black pepper. Pour about 300ml of water into the pan, enough to let the sauce down so that it covers the meat, stir everything well, cover with a lid and turn the heat right down. Lamb will take an hour or more to cook, mutton maybe an hour and a half. As the meat cooks, peel and slice eight onions and start to fry them in groundnut oil in a very large pan over a medium heat. This is a lot of onions. you may need either two batches or two pans. The idea here is to let the onions caramelise slightly without browning them too much. They need to cook slowly and gently so that they sweeten and collapse. When the meat is cooked, add the onions to the large pan, along with two big tablespoons of raisins and cook for a further five minutes. Check the seasoning, garnish with chopped fresh coriander and serve with rice, chapatis or naan bread. Oh my… my salivary glands are doing their thing! This is a wonderful dish! I've never actually cooked lamb or mutton but I'd like to. Where does one buy mutton? Perhaps it's at an ethnic grocery store that I don't go to? This look amazing! The flavors sound perfect, and it looks like it is about ready to just fall off the bone! Looks really tasty! I am glad that people all over the world like Indian dishes so much!!! This looks wonderful. I can imagine it being relly good when having friends over. Maybe preparing it the night before? Good for sharing with all the rice, naans et cetra. Yummy. Great job on the lamb curry, it looks amazing!